This year Hard Rock Hotel Penang has all the Christmas and New Year celebrations in store for all merry-goers during these festive holidays, which would include a lit-up Christmas tree, a line-up of holiday dining feasts, grooving rock ‘n’ roll parties and fun entertainment for all ages. 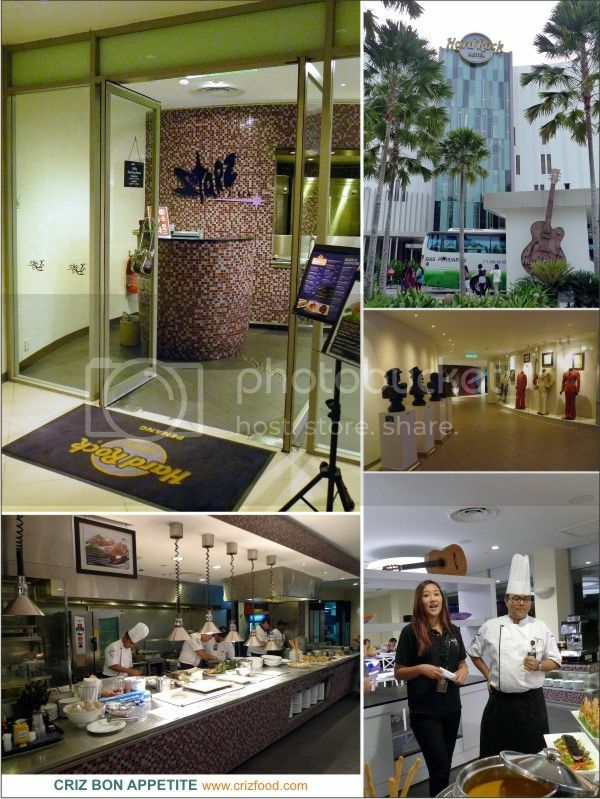 Thanks to the expertise of the kitchen team, patrons would get to get their best dining experiences at 3 different venues, namely Hard Rock Café, Starz Diner and Pizzeria. 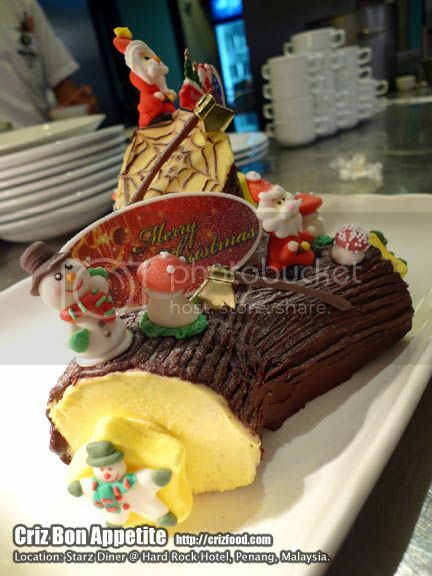 For those who prefer a sit-down meal, Hard Rock Café Penang offers a four-course lavish dinner on Christmas Eve that includes a starter, soup, a choice of main course and dessert. Diners are welcome to join the Christmas Eve Rock N’ Roll party for a rockin’ good time at no cost. It’s a one-of-a-kind party at Hard Rock Café Penang on Christmas Eve. Enjoy a night of rock ‘n’ roll with the resident band, Electra Het, performing semi-acoustic Christmas songs and resident DJ Steff spinning the all-time favourite Christmas playlist. All attendees will receive two complimentary drinks and a party pack. For those who fancy celebrating with a four-course meal, Hard Rock Café Penang offers the perfect dining choice including a starter, soup, a choice of main course and dessert. Diners are in for a special treat to join the New Year’s Eve countdown party at no cost. Celebrate New Year’s Eve countdown surrounded by iconic rock memorabilia and classic rock videos at Hard Rock Café Penang. Resident DJ Steff and resident band Electra Het will rock the night away with rock classics. There will also be a special YMCA vibe dance performance by the Beach Club team. Hard Rock Café Penang will give away two complimentary drinks and a party pack to all attendees. ‘Tis the season to enjoy a rockin’ good buffet! The hotel’s all-day dining restaurant will be whipping up a sumptuous spread of holiday must-haves for families and friends such as Whole Roasted Turkey with Spiced Chestnut Bread Stuffing served with Giblet Gravy and Cranberry Glaze, Chocolate Yule Logs and many more. It’s time to pop the bubbly, raise a glass and toast over a night of scrumptious food and good company at the Starz Diner. Some highlights on the International buffet line are Braised Seafood Jambalaya, Linguine Pasta with “Tobiko” and Seafood, Pavlova with Stone Fruit and Passion Fruit Cream and many more. 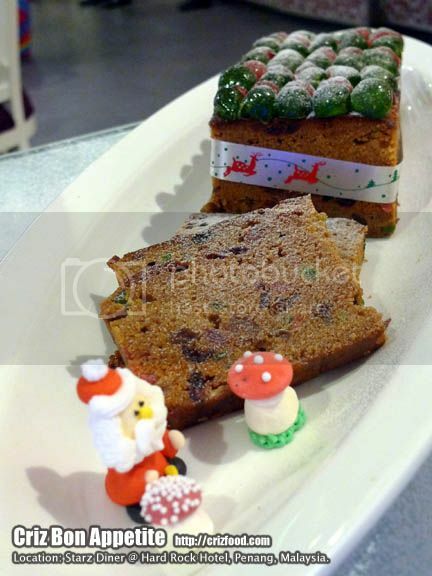 Let’s have a look at some of the dishes available during this Christmas and New Year at Starz Diner this year. While lil’ rockers are having a great time, parents can chill by the poolside and savour the widespread of festive goodness at Pizzeria. Some of the buffet highlights available on Christmas afternoon include Roasted Boneless Lamb Leg served with Cucumber Raita, Mint Sauce and Garlic Aioli Lamb Jus, Cranberry and Blueberry Clafoutis, Gingerbread Trifle and other festive goodies. This holiday season, Pizzeria is bringing cheer to seafood lovers. The Italian inspired al-fresco restaurant is serving a lip-smacking delicious array of seafood on Christmas Day, such as Pan-Fried Salmon with Horseradish Cream and Cherry Tomato Salsa, Stew Chilean Black Mussels in Spicy Tomato Sauce, Oven Baked Barramundi Fillet Cartroccio, Matcha Tiramisu and more. It’s all about big smiles and fun for the young in-house guests on Christmas Day at the poolside and the Hard Rock Roxity Kids Club. The hotel has arranged a full day of fun-filled activities to keep lil’ rockers upbeat and excited with entertainment, games and arts and crafts, such as vibe dance with Santa Claus, colouring contest, water volleyball and a baking contest. ROCK N’ ROLL COUNTDOWN: Hard Rock Hotel Penang has always been the ultimate place to celebrate during the holiday season. This year, the hotel offers two venues, so everyone can usher in the New Year like a rock star. Hard Rock Hotel Penang is throwing the biggest poolside party of the year with a line-up of entertainment for all ages. One of the highlights of the party is a series of exhilarating concerts like the Vibe Dance by the Beach Club team, a special performance by Mira &Friends, fire show by Nita Saad and a firework display when the clock strikes twelve. Resident DJ Nash and guest DJ Lady Anna, who will be making a guest appearance will be spinning the greatest rock ‘n’ roll hits of all time throughout the night. All attendees will receive two complimentary drinks and a party pack upon arrival, while an exclusive treat awaits the hotel’s in-house guests – four complimentary tickets per room to join the fun on this special occasion. Hard Rock Café Penang: Call +604-886 8050 or email hrc.admin@hardrockhotels.net. Hard Rock Hotel Penang: Located at the famous Batu Ferringhi Beach in Penang, Hard Rock Hotel Penang is a trendy hotel that sets itself apart from the conventional beach resort; blending rich music culture, contemporary design, and family-friendly facilities. The hotel boasts 250-rooms and suites, most of which feature beach frontage. The modern structure is completed with tastefully furnished bedrooms and modern in-room amenities. All rooms are equipped with DVD/CD players, 50-inch LED screen TVs, BOSE Sound Systems, free Internet Access, free HD Blockbuster Movies on Demand and interactive IPTV system. Hard Rock Hotel Penang features the largest free-form pool in Penang. With a large play area, the pool is a hit with children. We provide facilities for everyone and a plethora of fun activities and entertainment all day. Hard Rock International: With venues in 74 countries, including 185 cafes, 27 hotels and 12 casinos, Hard Rock International (HRI) is one of the most globally recognized companies. Beginning with an Eric Clapton guitar, Hard Rock owns the world’s most valuable collection of music memorabilia, which is displayed at its locations around the globe. Hard Rock is also known for its collectable fashion and music-related merchandise and Hard Rock Live performance venues. HRI owns the global trademark for all Hard Rock brands. The company owns, operates and franchises Cafes in iconic cities including London, New York, San Francisco, Sydney and Dubai. HRI also owns, licenses and/or manages hotel/casino properties worldwide. Destinations include the company’s two most successful Hotel and Casino properties in Tampa and Hollywood, FL., both owned and operated by HRI parent entity The Seminole Tribe of Florida, as well as other exciting locations including Atlantic City, Bali, Cancun, Daytona Beach, Ibiza, Orlando, Shenzhen and San Diego. Upcoming new Hard Rock Cafe locations include, Maldives, Manila, Malaga, Georgetown, Fortaleza, Rosario and Chengdu. New Hard Rock Hotel, Casino or Hotel & Casino projects include Berlin, Budapest, Desaru Coast, Dublin, London, Los Cabos, Madrid, Maldives, New York City, Ottawa, Sacramento, Dalian and Haikou in China. In 2018, Hard Rock International was recognized as a Forbes Magazine Top Employer for Women and Land Operator of the Year at the Global Gaming Awards. For more information on Hard Rock International visit www.hardrock.com. Ever since my encounter in dining at Starz Diner @ Hard Rock Hotel Penang during Chinese New Year last year, I’ve since felt in love with the culinary skills as well as the uniqueness in flavors that the hotel’s Chinese Sous Chef, Chef Yoong Toy Heng @ Chef Heng and his team had pepped up wondrous spread for the festive season. Do check out their Chinese New Year 2017 Rockin’ Reunion Buffet Dinner (27 January 2017), priced at RM138nett (Adult) and RM69nett (children 6-12 years old) as well as their Rock of Prosperity Seafood Buffet Dinner (28 January 2017), priced at RM128nett (Adult) and RM64nett (children 6-12 years old), at Starz Diner @ Hard Rock Hotel Penang from 6.30pm until 10.30pm this festive season. Please call +604-886 8057 or email fb.penang@hardrockhotels.net to book earlier to avoid disappointment. This buffet this year would offer a variety of mouth watering spreads starting from the must-have Yee Sang to traditional desserts and cookies. 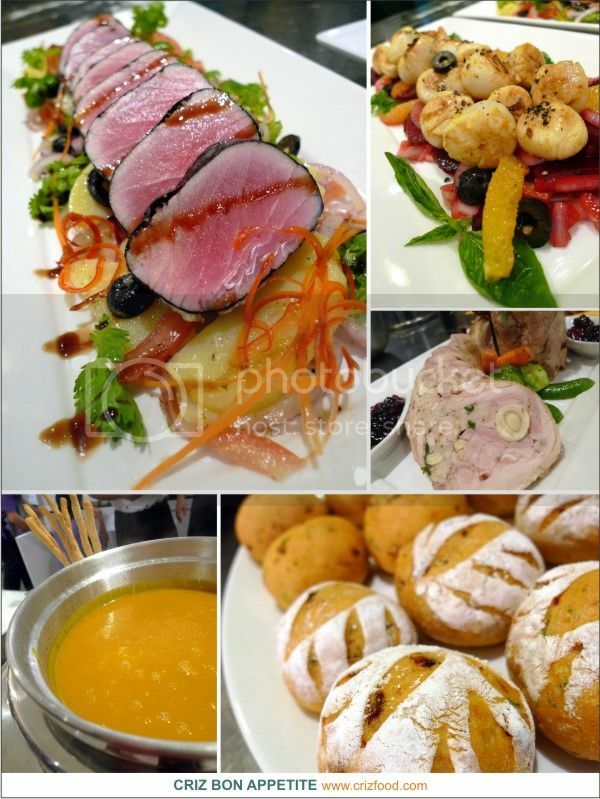 Here are some of the dishes that you might have during the buffet sessions. From Cold Platter, you might have Marinated Octopus Salad, Jelly Fish Papaya Salad, Chicken Roll with Thai Mango Salad, Pomelo & Mandarin and Shrimp Salad, Yee Sang Platter and more. You should try out the Braised Sliced Chicken and Seafood Treasure Soup as the stock was indeed so rich and nourishing that I had more bowls than I had anticipated. For the Main Course of Hot Dishes, you might get to savor their Steamed Glutinous Rice with Dried Oyster & Roasted Mix Meat (Reunion), Crispy Chicken with Prawn Cake and Marmite Chicken (Reunion), Braised Whole Duck with Eight Treasure Style (Day 1), Steamed Fish with “Pat Tong” Style (Day 1), Deep Fried King Prawn with Spicy BBQ Sauce (Reunion), Wok Fried Brown Crab with “Kam Hiong” Sauce (Reunion), Braised Seafood Treasure in Pumpkin and Garden Green (Reunion). Their braised duck has always been my favorite, considering that it had all the ingredients of my liking. The Braised Seafood Treasure in Pumpkin and Garden Green indeed was an eye-opening dish as I’ve yet to see any chef produced such an interesting and flavorful dish before. The combination of the natural sweetness from the added pumpkin puree combined with the rich seafood flavors from the added fresh scallops, dried oysters, sea cucumber, Chinese mushrooms and greens, made up the umani taste of this heavenly dish. As for desserts, you could expect to have Soya Bean Milk with Glutinous Ball, Leng Chee Kang, Glutinous Rice Cake, Chinese Cookies and more. Overall, both their Chinese New Year buffet spreads had the quality and value worth that no other hotels had ever produced. Moreover, the taste I savor each year had always excelled beyond my expectations. It’s another job well done by the kitchen team. 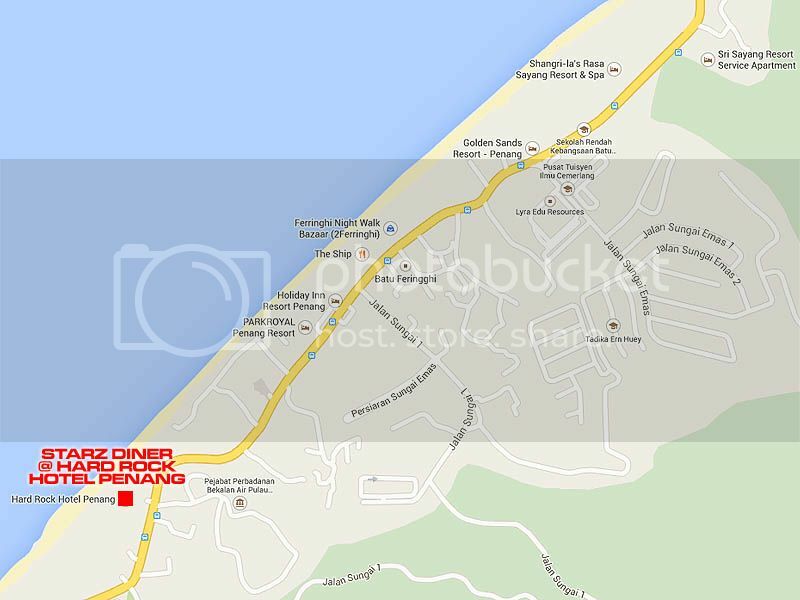 The Starz Diner is located at the left wing of Hard Rock Hotel Penang. Upon entering, just head to the left side and you will see a little glass door leading to the eatery. Hard Rock International: With a total of 204 venues in 64 countries, including 157 cafes, 22 hotels and 11 casinos, Hard Rock International (HRI) is one of the most globally recognized companies. Beginning with an Eric Clapton guitar, Hard Rock owns the world’s greatest collection of music memorabilia, which is displayed at its locations around the globe. Hard Rock is also known for its collectible fashion and music-related merchandise, Hard Rock Live performance venues and an award-winning website. HRI owns the global trademark for all Hard Rock brands. The company owns, operates and franchises Cafes in iconic cities including London, New York, San Francisco, Sydney and Dubai. HRI also owns, licenses and/or manages hotel/casino properties worldwide. Destinations include the company’s two most successful Hotel and Casino properties in Tampa and Hollywood, Fl., both owned and operated by HRI parent company The Seminole Tribe of Florida, as well as other exciting locations including Bali, Chicago, Cancun, Ibiza, Las Vegas, Macau and San Diego. Upcoming new Hard Rock Cafe locations include San Juan, Lagos and Gran Canaria, Spain. New Hard Rock Hotel projects include Daytona Beach, Dubai, Los Cabos, Tenerife, Abu Dhabi, and Shenzhen and Haikou in China. For more information on Hard Rock International, visit www.hardrock.com. From 2 April 2016 onwards, Starz Diner @ Hard Rock Hotel Penang would be promoting its all-new Seafood on the Rocks Buffet Dinner 2016 from 6.30pm until 10.30pm on every Saturdays. Priced at as low as RM99nett (Adult) and RM59nett (children 6-12 years old), you would get to savor a sumptuous arrays of seafood dishes in sashimi raw, chilled, grilled, stir fried and more. Please call +604-886 8057 or email fb.penang@hardrockhotels.net to book earlier to avoid disappointment. Here are the menus for your information. Please click on the photos for clearer views. You would be expecting some lovely seafood dishes ranging from Appetizers, Sushi & Sashimi, Seafood on Ice, Soup, Main Dishes, Teppanyaki Station, Chinese Carving Station, desserts and more. 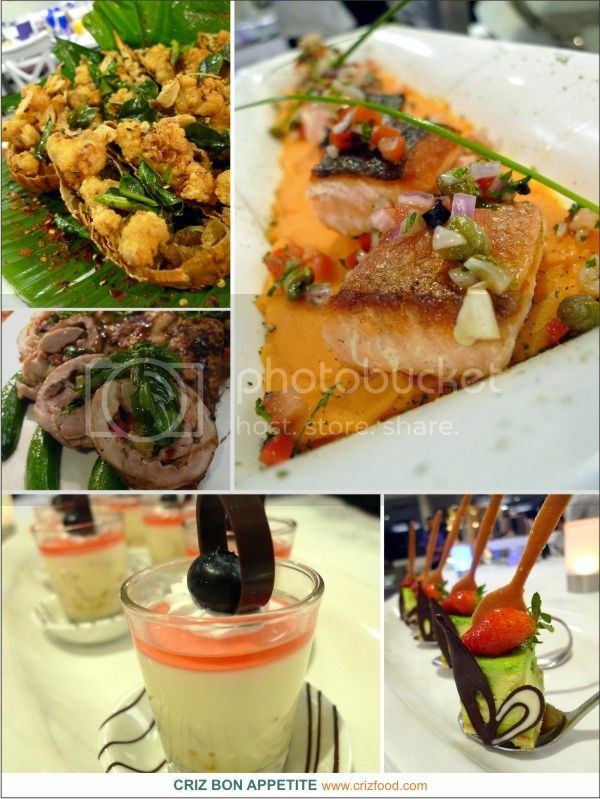 Here are some of the highlights of the buffet spreads for the Seafood on the Rocks Buffet Dinner 2016. For Appetizer, do watch out for the Smoked Salmon Salad with Avocado. Who could resist a salad packed with all the nutrients required for a healthy body? You could get lots of vitamins and minerals just from the fiber dietary packed vegetable. Moreover, the rich source of fat found in salmons would get your brain juice pumping well. On top of that, just like the salmons, avocados also contain omega-3 fatty acid and other beneficial properties for a healthier body. For Sushi & Sashimi, there would be quite good selections of sushi and maki with condiments for your palate. As for Seafood in Ice, you would expect to find a number of succulent and fresh seafood such as boiled prawns, mussel, bamboo clams, scallops, oysters and more, served with a number of condiments. If you are a lover of Seafood Soup plus an assortment of breads and buns, you should check out their Prawn & Shellfish Bisque which had a distinctive taste from the baked shells. This happened to be my favorite all the time. For Main Dishes, you would expect to see at least 9 dishes on the spread. More notable ones would be their Ying Yang Fried Rice, Deep Fried Prawns with Nestum and Chawan Mushi Unagi. I found the Teppanyaki Station to be quite extensive as they have most of my favorite choices cooked in different style. I quite like how the chefs prepared the slipper lobster by stir frying them in vegetables and stuffed back onto the shell. As for the Chinese Carving Station, you would expect to get items such as Roasted Chicken, Chicken Char Siew or even the uniquely prepared Lamb Char Siew. There would be at least 15 items served for Desserts. What caught my attention was the Soy Milk with Stuffed Glutinous Rice Balls & Ginkgo Nuts. Overall, I quite like their Seafood on the Rocks Buffet Dinner 2016 spreads as they were simple, deliciously prepared and tasty. Moreover, I would like to compliment the chefs for putting in their hearts into serving the diners as you could see by the amount of condiments they had stormed out for their teppanyaki dishes. With a total of 204 venues in 64 countries, including 157 cafes, 22 hotels and 11 casinos, Hard Rock International (HRI) is one of the most globally recognized companies. Beginning with an Eric Clapton guitar, Hard Rock owns the world’s greatest collection of music memorabilia, which is displayed at its locations around the globe. Hard Rock is also known for its collectible fashion and music-related merchandise, Hard Rock Live performance venues and an award-winning website. HRI owns the global trademark for all Hard Rock brands. The company owns, operates and franchises Cafes in iconic cities including London, New York, San Francisco, Sydney and Dubai. HRI also owns, licenses and/or manages hotel/casino properties worldwide. Destinations include the company’s two most successful Hotel and Casino properties in Tampa and Hollywood, Fl., both owned and operated by HRI parent company The Seminole Tribe of Florida, as well as other exciting locations including Bali, Chicago, Cancun, Ibiza, Las Vegas, Macau and San Diego. Upcoming new Hard Rock Cafe locations include San Juan, Lagos and Gran Canaria, Spain. New Hard Rock Hotel projects include Daytona Beach, Dubai, Los Cabos, Tenerife, Abu Dhabi, and Shenzhen and Haikou in China. For more information on Hard Rock International, visit www.hardrock.com. If you want to dine like the emperor, stay like the emperor and rock like the emperor, you should try out the Rock of Prosperity Chinese New Year Buffer Dinner 2016 at Starz Diner @ Hard Rock Hotel Penang from 6.30pm until 10.30pm on 7-8 February 2016. Priced at as low as RM99nett (Adult) and RM68nett (Children 6-12 years old), you would get to savor an extensive array of authentic Chinese and fusion under the expertise of the hotel’s Chinese Sous Chef, Chef Yoong Toy Heng @ Chef Heng, Demi Chef De Partie, Chef Hong Swee Aun and their kitchen team. Please call +604-886 8057 or email fb.penang@hardrockhotels.net to book earlier to avoid disappointment. Here are the summary and menus for those days. Please click on the photos for clearer views. Here are some of the highlights of the buffet spreads for the Rock of Prosperity Chinese New Year Buffer Dinner 2016. For the 2-days of buffet dinners, you would get to lavishly indulge in a wide variety of Chinese cuisine which would items such as hot and cold platters, soup of the day, Chinese main dishes, Yee Sang, Chinese BBQ Carving, noodles, steamboat and desserts. The best part to start off the auspicious occasion with great omen is the availability of a Yee Sang Station. You would find fresh ingredients ranging from Sliced Fresh Salmon (maybe fresh Tuna too), Sliced Abalone, Jelly Fish, Chinese Five-Spice Powder, Toasted Sesame Seed, Roasted Peanuts, Crispy Crackers, Red Pickled Ginger, Yellow Pickled Ginger, Green Pickled Ginger, Pickled Papaya, Pickled Cucumber, Pickled Onion, Yellow Yam Sliced, Red Yam Sliced, Green Yam Sliced, Lime, Lime Leaves, Carrot, White Radish and Plum Sauce. Let’s usher in the year of the Fire Monkey with a big bang of great health, wealth and happiness. The chefs had also pepped a number of Cold Platter Combinations such as Chicken Roll with Mango Sauce, Smoked Duck with Pineapple Sauce, Pomelo & Mandarin Orange Salad, Young Papaya Salad with Baby Octopus plus Sliced Chicken & Jelly Fish with Oyster Sauce. You might even get some of the appetizers in canapé servings. Some of the Chinese New Year dishes you could try out at Starz Diner would include Golden Vegetarian Shark Fin with Crabmeat and Eight Seafood Treasures Soup. It has been a long time since I had savored a rich stock starchy soup so heavenly pepped up with so many flavors. The kitchen indeed did put on hours of labor in simmering the stock. There was a significant taste of roasted poultry flavors in each sip. It was a dish so well done that it could put a lot of eateries in shame. Special highlights from the main dishes are the XO Chinese Seafood Fried Rice, Steamed Whole Chicken with Ginger & Black Fungus, Braised Lamb Leg with Superior Soy Sauce, Deep Fried Golden King Prawn with Butter & Chicken Floss, Stir-Fried Sea Scallops & Celery in Yam Ring and Braised Green Broccoli with Seafood Treasure & Black Moss plus Steamed Fish with Garlic & Chilies. I was truly impressed with quality of most of the main dishes especially the Steamed Whole Chicken with Ginger & Black Fungus, Deep Fried Golden King Prawn with Butter & Chicken Floss, Stir-Fried Sea Scallops & Celery in Yam Ring and Braised Green Broccoli with Seafood Treasure & Black Moss. You practically find lots quality ingredients used such as scallops, macadamia nuts, various types of mushroom, soy based vegetarian pork belly, dried oysters, sea cucumbers, fish maws, black moss and more in quite a number of the dishes. Wow! It’s like a meal fit for the emperor! Having steamboats are always merrier encompassing families during Chinese New Year dinners. Bask in an array of meat, vegetables and noodles accompanied with Clear Chicken Soup and Bamboo Soup and a selection of sauces. The hotpot would be available at the buffet spread action counter – DIY style. However, there would be a chef on standby to help you with your requests. You could also end the meal with some sweet temptations such as a bowl of delicious Hot Chinese Traditional Famous ‘Leng Chee Kang’, Chinese Glutinous Rice Cake with Yam and Sweet Potato, Fried Crispy Shanghai Pancakes, some Chinese cookies, Mandarin oranges and more. For those who would fancy a set dinner instead of a buffet dinner may opt for Hard Rock Café Prosperity Rock Platter, available for 2 persons at RM160nett or 3 persons at RM240nett. The promotion would be from 1-13 February 2016 from 11.30am until 11.30pm. Diners will be given a choice of Soup of the Day served with Garlic Bread or a House Salad – fresh green salad served with a choice of house dressing. For the mains, delight in a combo of Potato Skins, Chicken Fried Rice, Sweet and Sour Fish, Five Spices Bar-B-Que Chicken, Mini Beef Burgers with Plum Sauce, Deep Fried Prawn with Thai Chili Sauce, Hickory Smoked Pulled Lamb Sandwiches and Chicken Wings with Sweat Sticky BBQ Sauce. To end the perfect meal, enjoy a savory Hard Rock Cafe’s signature dessert –Mini Apple Cobbler served with vanilla ice cream. Overall, I quite like their Chinese New Year buffet spreads as they were more authentic than most eateries I have tried to date. With so many types of rich ingredients used, the taste of course excelled beyond my expectations. Thanks to the two skillful Chinese chefs that we could savor quality Chinese cuisine from Hard Rock Hotel Penang. With the festive seasons of Christmas and New Year just around the corner, Hard Rock Hotel Penang will be having a few promotions to pamper its guests and diners with an extensive spread of delectable dishes under the expertise of the hotel’s kitchen team [From left to right: Rizal bin Hashim (Sous Chef), Abdul Rahim Bin Mohammad (Sous Chef), Mohd Nazir Bin Aziz (Chef De Cuisine), Zulkanai Bin Md Elias (Kitchen Manager) and Wan Mohd Shahrul Bin Wan Mohd Saad (Sous Chef)]. Do enjoy the delightful holiday treats this Christmas & New Year eves at Starz Diner @ Hard Rock Hotel Penang from 6.30pm until 10.30pm. Please call +604-886 8057 or email fb.penang@hardrockhotels.net to book earlier to avoid disappointment. For both Christmas and New Eve dinners, you would get to indulge in their maki platters (Abuni Salmon Maki, Cheese Maki, Unagi Maki, Rainbow Maki, etc) plus bread and rolls (Grissini, Olive Bread, Multi Grains, Baguette, etc). Their Grissini (breadsticks) were one of the best I’ve tasted. On the eve of Christmas, Starz Diner will be offering a Christmas Eve Rock ‘n’ Roll Buffet Dinner at RM186nett/pax, inclusive of a complimentary party pack and lucky draw. Some of the dishes to look out for would be their Prawn Tikka with Mango Melon Salsa, Asparagus with Crab Meat Salad, Shellfish Bisque, Roasted Turkey with Giblet Gravy & Cranberries Citrus Sauce, Cajun Spice Red Snapper with Shrimp and Mussel Salsa, Miniature Berry Gingerbread Cakes and Chocolate and Cherry Yule Logs. 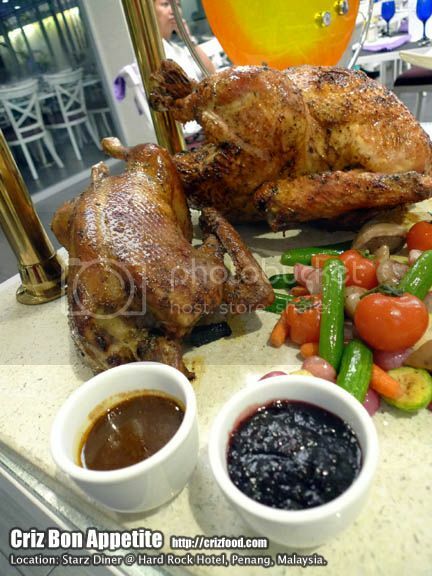 The highlight of any Christmas meal would be their Roasted Turkey with Giblet Gravy & Cranberries Citrus Sauce, Glazed Nuts Stuffing, Potatoes and Seasonal Vegetables. It was the perfect dish to start off the festive season. Ooo.. I always enjoyed my turkey with their sauces. Those condiments were some of the best ones around. Their Chocolate & Cherry Yule Logs was one of the good ones around, considering that the cake was moist and fluffy without being too sweet. Of course, there would be the English Fruit Cake with Glazed Fruits. Sweet as it is, it’s a great dessert to end the dinner over a cup of hot tea. For those who would fancy a set dinner instead of a buffet dinner may opt for Hard Rock Café Penang’s 4-course Christmas Eve Dinner at RM185nett/pax. The dinner offers a starter – Mini Citrus Salad and a Cream of Lobster and Crab soup. For the choice of mains, the café will be serving a choice of Roasted Five Spiced Lamb Rack, Roasted Turkey Breast and Pan-fried Atlantic Salmon. For dessert, diners will feast on a delicious Strawberry Meringue with Berry Compote and Wild Berry Macadamia Gelato. Dinner would include two selected drinks and a complimentary party pack. If you are not into set or buffet dinners but wanted something fulfilling to celebrate with a group of family members or friends, you could always try out their December promotion at Pizzeria with Chef Joe’s specially concocted Santarina Turkey Pizza (RM40nett), from 11.30am until 10.30pm daily. This pizza is oven-baked to perfection with grilled turkey breast with mushroom glaze, tomato salsa, spinach and cranberry sauce. At the Hard Rock Café Penang, satisfy your taste buds with a Holiday Rock Platter, available for 2 persons at RM160nett or 3 persons at RM240nett. Serving until 23 December 2015, this platter is big enough to share and guaranteed to rock your palate. This platter comes with a choice of starter – House Salad or Soup of the Day. For the main course, diners will indulge in a sharing platter consisting of Potato Skins, Onion Rings, BBQ Beef Ribs, Spaghetti with Prawn Paste, Mini Beef Burgers with Satay Sauce, Chicken Wings with Chipotle BBQ Sauce, Ferringhi Ikan Bakar with Portuguese Sauce and Pulled Lamb Sandwich with Carolina Mustard BBQ Sauce. Homemade Brownie with Vanilla Ice Cream would be served for dessert. 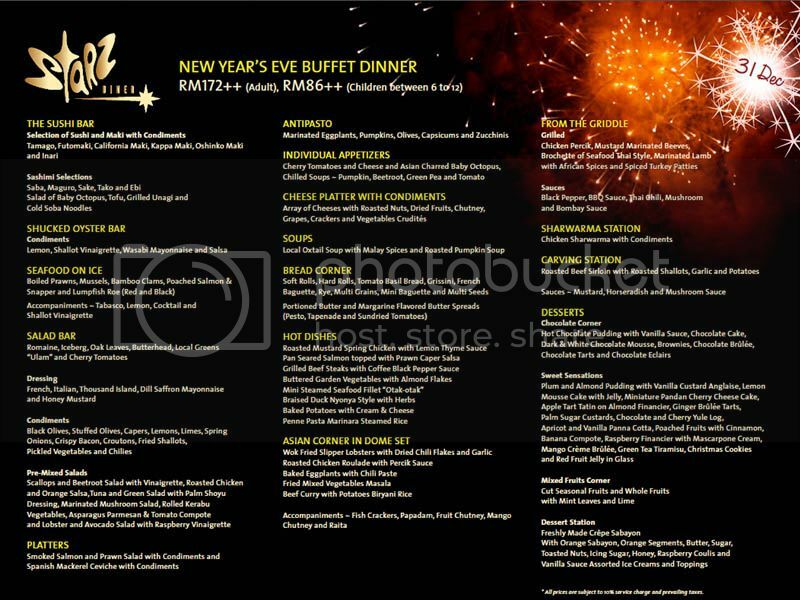 On New Year’s Eve, Starz Diner will be serving a New Year’s Eve Buffet Dinner at RM199nett/pax inclusive of a complimentary party pack and lucky draw. Some of the highlights to look out for are the Homemade Salmon Gravlax and Marinated Prawn with Condiments, Chilled Shooters (pumpkin, beetroot, green pea & basil tomato), Roasted Chicken served glazed baby carrot and citrus tapenade, Coffee Crusted Beef Fillet with Pumpkin Puree and Shallots Gravy, Mix Berries Financier with Mascarpone Cream and Mango Crème Brûlée. On top of that, there’ll be two more promotions for New Year Eve at Pizzeria and Hard Rock Café. Pizzeria’s New Year’s Eve Seafood Buffet Dinner at RM199nett/pax which would include a variety of Cold Platters, Chilled Seafood, Salad, Antipasto, Cheese Platters, Soups, Hot Dishes, BBQ Seafood, Pasta & Carving Station, Pizzas and Desserts. The promotion would also include a complimentary party pack and lucky draw. On the other hand, Hard Rock Café Penang will be offering a 4-course New Year’s Eve Dinner at RM195nett/pax. The Starter would include a Mini Chicken Chop Salad, Creamy Leek and Fennel plus Potato Soup. The options for the Main Courses would be either a choice of Grilled Marinated Angus Strip Loin & Pacific Scallop, Baked Sesame Cod Fish & Grilled Sambal King Prawn or Oven Baked Lamb Rack & Tandoori Salmon. Diners would be served a delightful Tiramisu Mascarpone Mousse with Pistachio Biscotti and Coffee Gelato to end the meal. Overall, the specially crafted dishes were palatable for all who love to savor some traditional as well as fusion items during these coming festive seasons. Of course, the Roasted Turkey and Stuffing would be the main highlight during this Christmas promotion and that Coffee Crusted Beef Fillet with Pumpkin Puree & Shallot Gravy would be something new to savor during this New Year Eve. When you want to live and feast like rock stars, you have to pay a visit to Malaysia’s sole rock & roll concept themed hotel – Hard Rock Hotel, Penang. Do be quick in wearing your rocking shoes with your family and friends to experience their Bintang Rock Buffet Dinner at Starz Diner @ Hard Rock Hotel Penang. The buffet has started since 18 June 2015 and will continue to tempt your palate until 16 July 2015 from 6.30pm until 10.30pm. The seasonal buffet dinner is priced at RM88nett (adult) and RM48nett (child aged 6-12 years old). Please call +604-886 8057 or email fb.penang@hardrockhotels.net to book earlier to avoid disappointment. Bintang Rock Buffet Dinner would offer a wide selection of freshly prepared dishes from local starters to meat grills, hawker fares, and desserts to cater to the taste buds of diners. Other than the commonly available ready-made salads, I did find something unique that I have yet to come across in patronizing the many buffet spreads out there. They have a special counter set up to cater to those who love having salads – the Malaysian style. It was not about having Ulam-ulaman (wild herbs and vegetable) served with the usual sambal condiments but a DIY counter for your favorite Kerabu (Malaysian salad). Gosh! Can you imagine how heavenly it was to have Kerabu of your preference made freshly right in front of you? This is truly one of it kinds I have encountered throughout my food writing career. On top of that, I did also find this section to be full of surprises as those little glasses of appetizers were not there just for display but were packed with small bites that were amazingly appetizing. I quite like the Tandoori Marinated Chicken Cubes that were hidden amongst the food treasures. Coming to the Starters Section with items of the day such as Bubur Lambuk and Minestrone Soup served with an assortment of bread rolls, the dishes were flavorfully packed with ingredients. I did find the Minestrone Soup to be tasty as it was filled with a variety of vegetables, meat and seafood to give its rich flavors. The Nasi Kandar Section were simple and yet fulfilling for those who love this Penang favorite. It had some rice options with a few varieties of local spiced up dishes such as Fish Molee, Ayam Masam Mamak, Daging Masak Congo and more. Beside these dishes were some local and international hot dishes that might interest you as well such as Sauteed Vegetables, Seafood Thermidor, Green Curry Chicken and more. You should not miss out the Arabian section for their nicely pepped up Arabic Roasted Lamb Leg in Dome served with Arabic rice, cous cous, pita bread, alongside with chutney and yoghurt as condiments. Each mouthful of the fragrantly cooked rice with the tender pieces of the roasted lamb was above cloud 9. I must compliment Chef Joe Elias for a job well done. The Hot Dishes and Grill Section would stretch from indoor until outdoor and I found it to be rather interesting. Other than Chicken Shawarma Wrap, I did also find my usual Mamak Roti John there. Again, this was something that caught my attention. Moving along the line of many individually banana leaves wrapped grilled fishes and shellfish was something quite rare on any buffet spread. It was the Pahang originated Pais Ikan Sambal or quite commonly known as Balinese Style Pesan Be Pasih aka Grilled Fillet of Fish in Banana Leaf. It looked quite similar to the herbs and spices packed Nyonya style Otak Otak, but had more distinctive flavors from added lemon basil, bay leaves and lemongrass minus the usage of egg. Wow! That was a bonus! Following the buffet line were Char Koay Teow, Chicken Wings and an assortment of Satays. If all those interesting dishes did not tempt you, you can always lay back and enjoy their cool Dessert Section with a selection of free-flowing Beverages of the Day. I would say their desserts which consisted of international standards of cakes and pastries plus some add-ons of local kuih-muih were plentiful enough to ease the craving of those sweet tooth diners. Ais Kacang, Chinese Pancake with Lotus Paste/Red Bean Paste served with Hot Caramel Sauce, Ice Cream, Sago Gula Melaka were some of the desserts to look out for. However, the winners would go to their rich Spiced Cardamon Bread & Butter Pudding, Hot Chocolate Pudding and Crème Brulee. I just wished I had the stomach space for more as these desserts were amazingly saliva dripping. We had Menu 5 for the day and it was impressively presented. I’m sure the rest of the menus will be just as great as well. Let’s have a peep onto the menus which would be on a rotation basis for the whole promotion. Do click to enlarge for a better view. Overall, from the Menu 5 which we had tasted, I did find the dishes to be rather attractive and out of the norm from the usual dishes served at the rest of the buffets out there. Dining here was like being a nomad trekking his way from continent to continent into Europe, then into Middle East before landing on the shore of Asia for more herbs and spices spiked up cuisine. As for the desserts, they sure know how to tempt those sweet tooth diners with their amazingly concocted selections of good quality pastries and cakes. For those who are not ardent fans of buffets, you can always opt for their gigantic serving of Rock Platters at Hard Rock Café instead. The promotion is from 18 June until 16 July 2015 (11.30am-10.30pm) at RM160nett (for 2 pax) and RM240nett (for 3 pax). For reservations, please contact the Hard Rock Cafe admin at +604-886 8054. As for their Relax & Feast Package Promotion (18 June until 16 July 2015), a specially designed package to cater to your need to get away from the hustle and bustle of the city life, the rates will start from RM420++ per room per night inclusive of buffet breakfast for two adults and two children. Enjoy a choice of daily Early Bite Breakfast (4.00am-5.30am) or Buffet Breakfast (6.30am-11.00am). They have got your dinner covered too with option to try out their Bintang Rock Buffet in Starz Diner or savor the Rock Platter at Hard Rock Cafe Penang. For more info, please visit www.penang.hardrockhotels.net. About Hard Rock International: With a total of 200 venues in 64 countries, including 154 cafes, 21 hotels and 10 casinos, Hard Rock International (HRI) is one of the most globally recognized companies. Beginning with an Eric Clapton guitar, Hard Rock owns the world’s greatest collection of music memorabilia, which is displayed at its locations around the globe. Hard Rock is also known for its collectible fashion and music-related merchandise, Hard Rock Live performance venues and an award-winning website. HRI owns the global trademark for all Hard Rock brands. The company owns, operates and franchises Cafes in iconic cities including London, New York, San Francisco, Sydney and Dubai. HRI also owns, licenses and/or manages hotel/casino properties worldwide. Destinations include the company’s two most successful Hotel and Casino properties in Tampa and Hollywood, Fl., both owned and operated by HRI parent company The Seminole Tribe of Florida, as well as other exciting locations including Bali, Chicago, Cancun, Ibiza, Las Vegas, Macau and San Diego. Upcoming new Hard Rock Cafe locations include San Juan, Lagos and Busan, South Korea. New Hard Rock Hotel projects include Daytona Beach, Dubai, Los Cabos, Tenerife, Abu Dhabi, and Shenzhen and Haikou in China. For more information on Hard Rock International, visit www.hardrock.com. Hard Rock Hotel Penang will be having a few promotions this festive season to pamper rock star wannabes in Penang under the expertise of the hotel’s Executive Chef, Chef Zul, whom also bagged “The Best Western Chef “ Award in this year’s 7th Gastronomique Penang. Do enjoy his delightful holiday treats this Christmas & New Year eves at Starz Diner @ Hard Rock Hotel Penang from 6.30pm until 10.30pm. Please call +604-886 8057 or email fb.penang@hardrockhotels.net to book earlier to avoid disappointment. 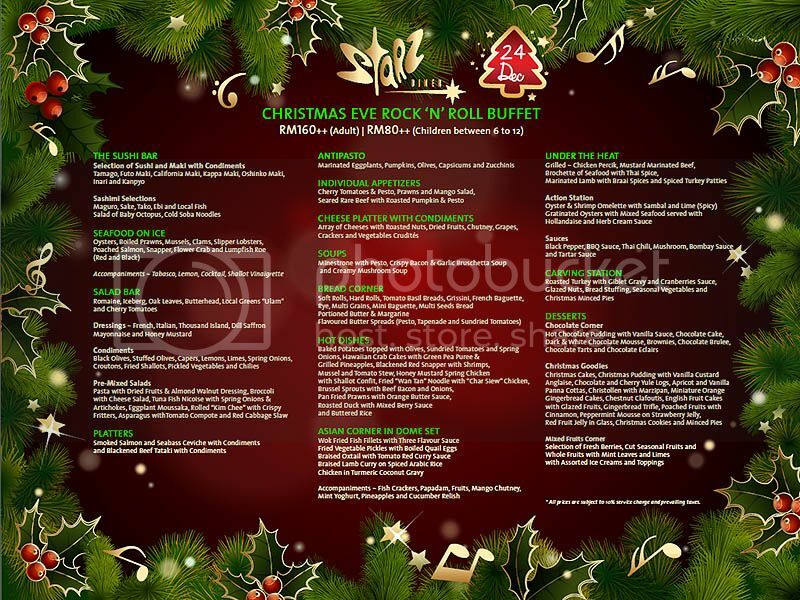 The Christmas Eve Rock ‘n’ Roll Buffet Dinner is priced at RM 160++ per person. You will be expecting a wide selection from the sushi bar, salad bar, platters, hot dishes, action station, carving station, desserts and more. 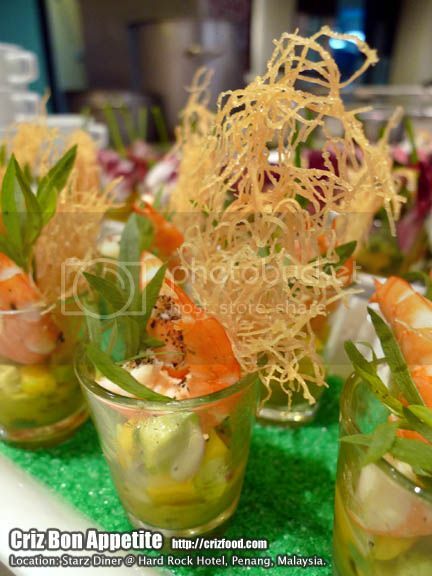 First, we’ll have Tiger Prawns with Mango and Avocado Salad as appetizer. Fresh prawns with cool salad dressing will always be the best to start off a meal. 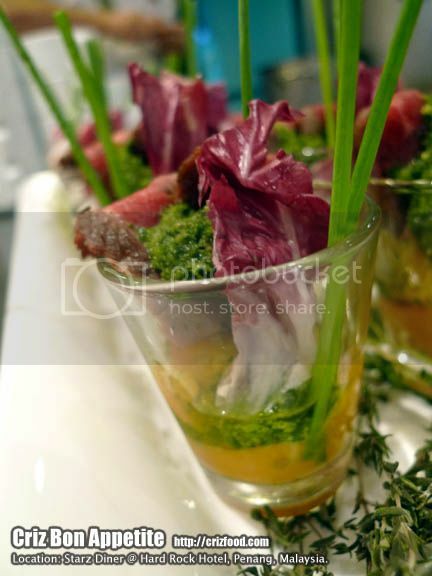 If you are not a fan of seafood, there’ll always be the Seared Rare Beef with Roasted Pumpkin and Pesto. Not a bad combination though but I would prefer some beef jus added to add in more flavors. The highlight of any Christmas meal will always be the roasted turkey, what more it’s organically fed without added antibiotic or hormone. We were treated with Roasted Turkey with Giblet Gravy with Cranberry Sauce, Glazed Nuts Stuffing, Sweet Potatoes & Seasonal Vegetables. Oh My… This is the best turkey I ever had and the meat was juicy and tender unlike others. Combined with the condiments of gravy and sauce plus the stuffing, it was a perfect meal for the whole season. 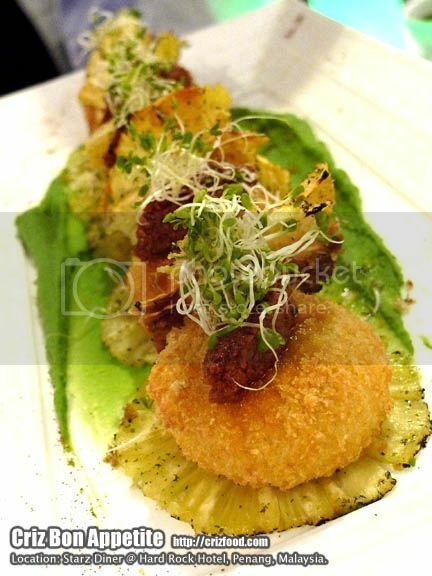 The next dish which was the Hawaiian Crab Cakes with Green Pea Puree and Grilled Pineapple was awesome. 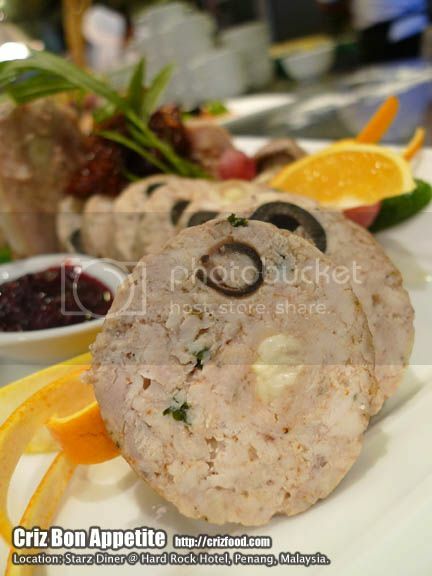 Soft in the inside will the juiciness of the seafood combined with the crusty outer layer was perfect for any party. Christmas will not be Christmas without the Chocolate & Cherry Yule Logs. This was one of the good ones around. Of course, there’ll be the English Fruit Cake with Glazed Fruits. Sweet as it is, it’s a great dessert to end the dinner over a cup of hot tea. On the other hand, the New Eve Buffet Dinner is priced at RM 172++ per person. You would be served with a wide variety of fresh oysters from the Shucked Oyster Bar, chilled seafood, appetizers, Asian corner, shawarma station and many more. On top of that, there’ll be two more promotions for New Year Eve at Pizzeria and Hard Rock Café. Pizzeria will be having its Seafood Buffet Dinner featuring a charcuterie bar, BBQ seafood, pizzas, carving station and more while Hard Rock Café is offering a 4-course dinner at RM 170++ per person featuring a starter, soup, a choice of main course and dessert. Overall, the dishes are specially crafted for the festive seasons and can be quite palatable for those who love to savor those once a year delicacies, especially that yummy and memorable flavors of the Roasted Turkey and Stuffing that still lingers in my mouth.